Learn how to make pancake bites from scratch! 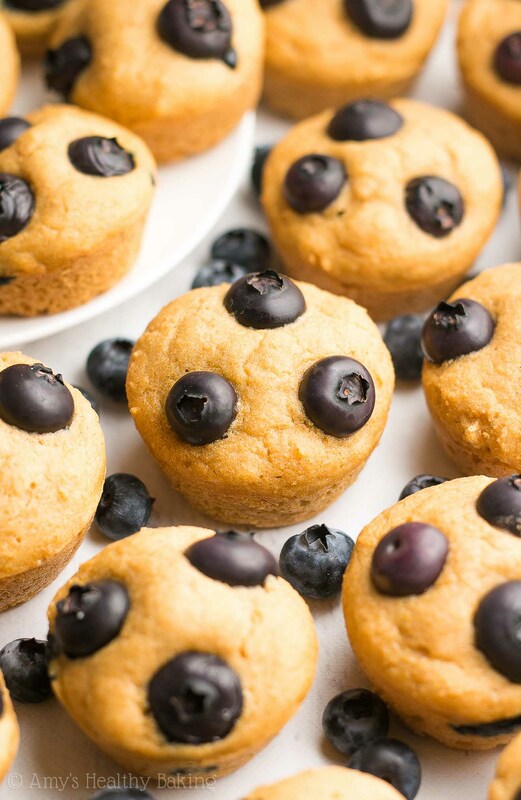 They’re light and fluffy, full of sweet juicy blueberries & perfect for on-the-go breakfasts! Only 29 calories & this recipe is so easy to make! During my childhood, our school district implemented a new policy for a “Late Day” each week, so every Wednesday, the morning bell rang an hour later than usual. This gave the students a chance to catch up on sleep while the teachers graded papers or attended department meetings. As a band geek with an extra class held an hour before school normally began, I especially loved those late Wednesdays once I reached middle and high school… The school board elected to eliminate A Period on Wednesdays, so I started class at 9 am instead of 7 am! With no need to scarf down a quick bowl of cereal before dashing off to school on Wednesdays, Mom often cooked us a special hot breakfast. She kept it simple, opting for something like scrambled eggs, waffles, or French toast. But we all looked forward to pancake Wednesdays the most! Mom dolloped our plain batter onto the pan in the shape of Mickey Mouse, just like at our favorite brunch restaurant, and afterward, she tossed a big handful of fresh blueberries into the rest of the batter for her pancakes. 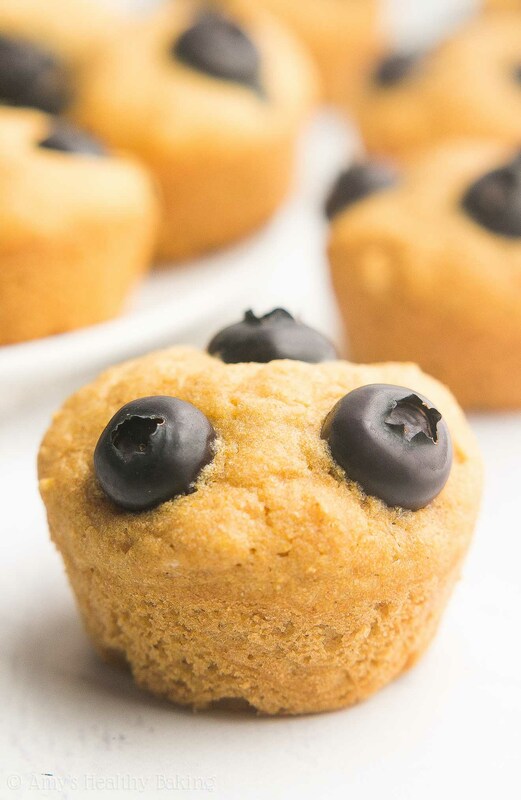 If only we had this recipe for Healthy Blueberry Buttermilk Pancake Bites back then… We could’ve eaten pancakes every day of the week—not just late Wednesdays! They’re light and fluffy, just like my favorite pancakes, but they’re easily portable and a perfectly acceptable finger food. Plus they’re just 29 calories! This easy recipe is a spin off of my ultimate healthy blueberry buttermilk pancakes. It starts with white whole wheat flour, which sounds like a paradox! However, white whole wheat flour is made by finely grinding a special type of soft white wheat, whereas regular whole wheat flour comes from a heartier variety of red wheat. This gives white whole wheat flour a lighter taste and texture (very similar to all-purpose flour! ), but it has the same health benefits, like extra fiber, as regular whole wheat flour. Note: I included my favorite gluten-free option in the Notes section of the recipe, if you prefer! Whereas many traditional pancake recipes call for ¼ cup (or more!) of butter, you’ll just use ½ tablespoon in this recipe! The rest of these pancakes’ tender texture comes from a combination of Greek yogurt and low-fat buttermilk. Greek yogurt is one of my favorite ingredients because it provides the same moisture as extra butter or oil for a fraction of the calories, and it gives your pancakes a protein boost too! Since I mainly use low-fat buttermilk for pancakes (and these few recipes! ), I rarely finish off a carton before it goes bad… So I use this powdered buttermilk instead! It has the same iconic flavor and behaves exactly the same as regular buttermilk, but it stays fresh for ages. I love keeping it on hand for whenever I start craving pancakes! 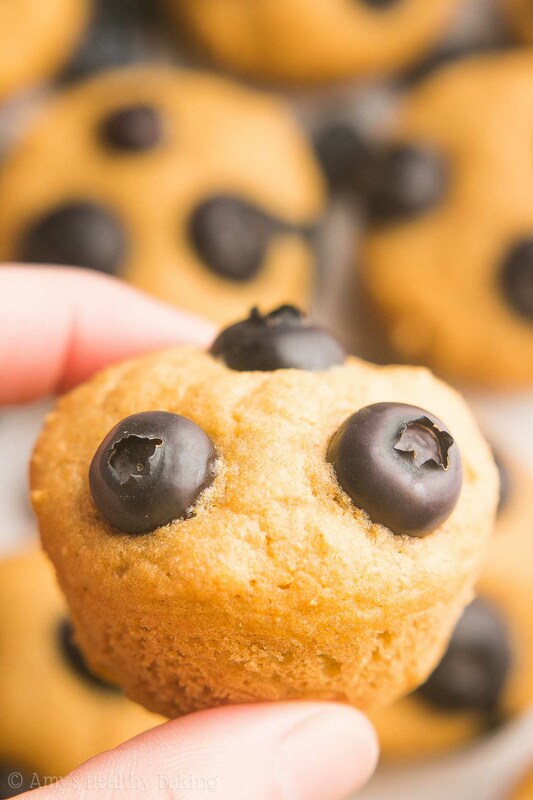 Once you’ve whipped up the batter and dolloped it into the mini muffin cups, you’ll press a few fresh blueberries into each just before baking. (Frozen will work too, in a pinch!) The berries add so much sweet fruity flavor that these pancakes barely need any added sweetener… But I’ll still never refuse a little maple syrup on the side! And just like that, your pancake breakfast is ready—for the entire week! ?? And when you make your own, remember to snap a picture and share it on Instagram using #amyshealthybaking and tagging @amyshealthybaking IN the photo itself! (That guarantees I’ll see your picture! ?) I’d love to see your pancake bites! 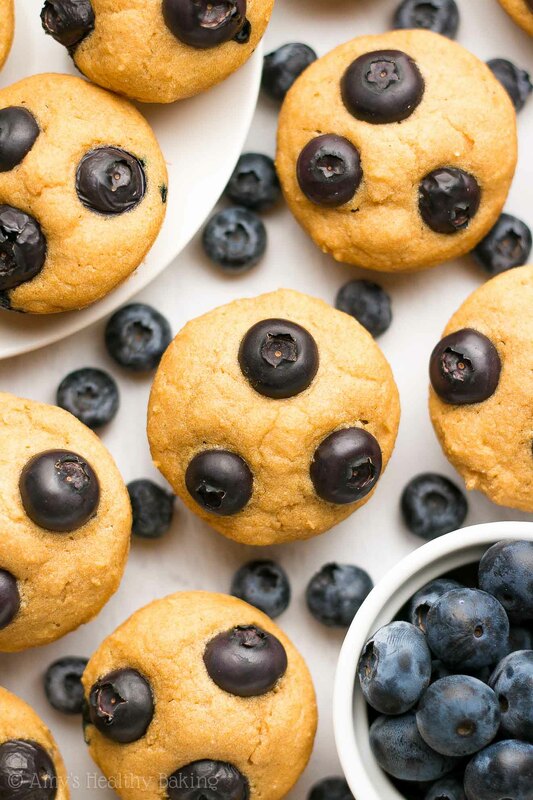 These pancake bites are perfect for quick and easy on-the-go breakfasts! The juicy blueberries add lots of natural sweetness to the rich, buttery batter. The pancake bites will keep for at least a week if stored in the refrigerator, and they freeze well too! Preheat the oven to 350°F, and coat 24 mini muffin cups with nonstick cooking spray. In a small bowl, whisk together the flour, baking soda, baking powder, and salt. In a separate bowl, whisk together the butter or coconut oil, egg white, and vanilla. Stir in the buttermilk. Stir in the Greek yogurt and maple syrup, mixing until no large lumps remain. Gently stir in the flour mixture. Divide the batter evenly between the prepared mini muffin cups (they should be filled halfway or less! ), and gently press 2-3 blueberries into the tops. Bake at 350°F for 10-12 minutes or until the tops feel firm to the touch and a toothpick inserted into the center comes out clean. Cool in the pan for 5 minutes before carefully transferring to a wire rack. Notes: For the gluten-free flour, I recommend the following blend: ½ cup (60g) millet flour, ½ cup (60g) tapioca flour, 2 tablespoons (15g) brown rice flour, and ¾ teaspoon xanthan gum. Most store-bought gluten-free flour blends will work as well, if measured like this. I highly recommend this powdered buttermilk! It’s inexpensive, shelf-stable, and will keep for ages if stored in the refrigerator. It has the same iconic flavor as fresh buttermilk and behaves exactly the same in recipes. Alternatively, mix together ½ cup (120mL) of any milk (dairy or non-dairy) and 1 teaspoon fresh lemon juice or vinegar. Let that sit for 5-10 minutes before using in this recipe. Frozen blueberries will also work. The baking time may increase slightly. These pancake bites look absolutely adorable! Sometimes, I find the flipping pancakes is just waayyy too much work, and this would be a great way to get my pancake fix. Also, lately, I just got a huge bottle of authentic maple syrup, and I think it would pair splendidly with these bites. Thanks Elaine! I totally agree — I get tired of flipping after one pan… And then there’s still ¾ of the batter left! 😉 I’d love to hear what you think of these pancake bites if you try them! My school had ealy release on Thursdays, I don’t know what the reasoning was, but I didn’t mind! 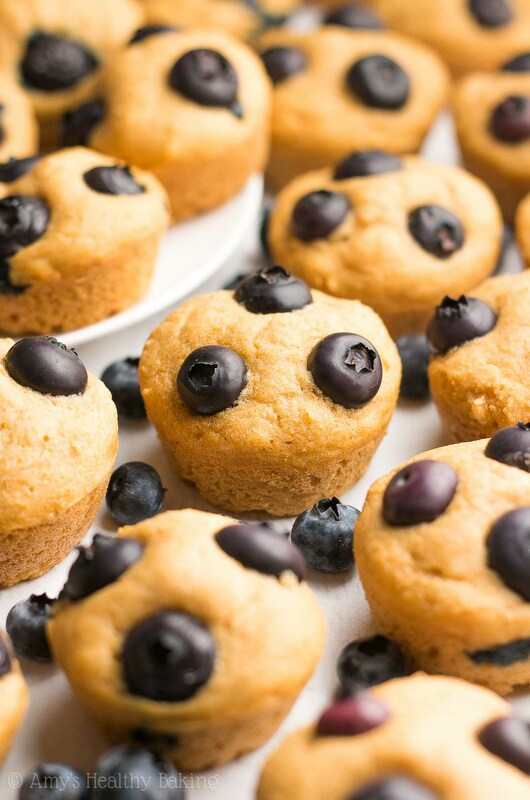 Those blueberries look SO plumb in those muffins, YUM! That sounds just as awesome as late Wednesdays! 🙂 Thanks Brittany! Wow! These look like a super yummy breakfast on the go. I’ll have to surprise my work friends with a plate of these. Usually have hard time figuring out how to communicate with you. Hope this works. Live suburban Chicago. Probably close to age, 72, of your beloved recently deceased grandfather. Enjoy your personal stories. Just finished last piece of carrot cake Greek yogurt pound cake. Loved it. I’m healthy fit vegetarian. No white flour, sugar, butter. I also substitute fat free Greek yogurt, honey, wholewheat white flour, butter milk, etc. About to make your blueberry buttermilk pancake bites. 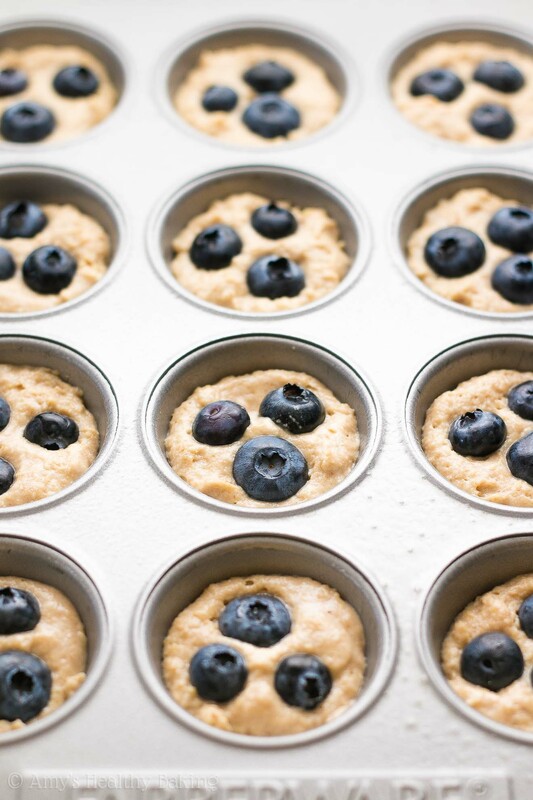 But move up to full size muffins (12 muffin pan), mix blueberries into batter and honey instead maple syrup. This may seem like a silly question, but you turn the powdered buttermilk into buttermilk with water before you use it in the batter, right? Or do you use it in its powder form? Not a silly question at all, Cassandra! 🙂 I add the buttermilk powder to the flour mixture, and I add the corresponding water where the recipe calls for the regular buttermilk. If you add the buttermilk powder to water, it tends to clump, so that’s the trick I use! 😉 I can’t wait to hear what you think of these pancake bites!